Walking festivals have been around for quite a while but are now proliferating at such a rate that there is often one on many weeks of the year all over the country. They are also very useful as a “tool” for towns to promote themselves and increase footfall for tourists to the area. However, if you are a keen walker, and fancy a holiday in a different area with all the organization done for you, then they’re great. The year before last, with my wife off skiing, I decided to hire a cottage in Crickhowell, which is one of my favourite bases for walking in the Black Mountains. 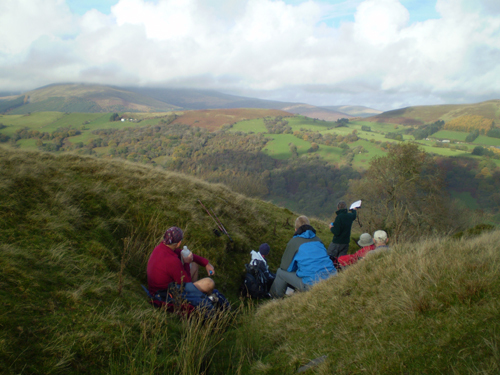 Whilst I was there I picked up a brochure for the Crickhowell Walking Festival which had just finished a week or two before and having studied the really interesting programme I made a note to take part this year. 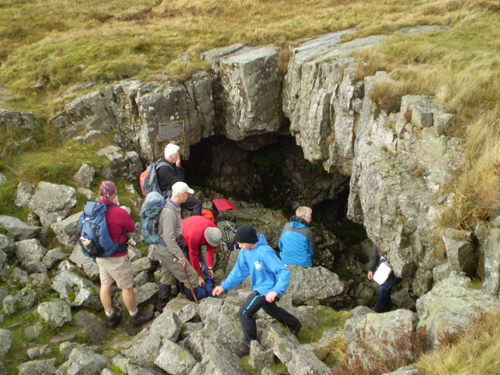 Well, this year’s programme had a total of 62 walks which were conveniently split up into different lengths and degrees of difficulty. I booked in for either 3 or 4 footprints which tended to be between 12 and 15 miles and often with up to 3000 feet of ascent. This makes the festival one of the most demanding ones but which suits me well. There was an added advantage as well in that if you are a member of The Brecon Beacons Park Society (£13 a year) there’s no charge (normally £5 for each walk) if you chose a walk led by one of the BBPS leaders. The amazing thing about Crickhowell is that it appears to have it’s own micro climate. In 2009 I experienced just one hour of rain and in 2010- wait for it- ZILCH. That probably means that in 2011 it will probably rain the whole time! but I am still going for it again . Going back to this year. I was still not 100% with the knee and was rather worried on the first day trudging up Pen-yr- Gadair Fawr in several inches of snow but that was the worst and I got to meet a number of walkers who continued on the same walks as myself and which also introduced me to parts of the Black Mountains I hadn’t seen before. I couldn’t get back into the same place I had in 2009 and ended up on a farm complex at Llangattock which is about a mile outside Crickhowell but not too far from one of my favourite pubs (more of a hotel) The Bear. I had a day off in the middle of the week and took myself off to Hay on Wye for some book hunting and then on the way back called in at the commodious Glyffaes Hotel which is off the A40 on the way to Brecon. The owner was leading several shorter walks for the festival and they do the most fantastic buffet tea which was part of my reason for calling! There were also several social evening events including a talk by Don Brown the famous climber. All in all, a great festival. I just hope that it doesn’t get too big or that the shorter walks take more priority. I was also joined by Cheltenham Rambling Club walkers Anne Ochala and Bea Therin who came over for several day walks.